Sorry, I missed blogging on Monday. Yesterday I was going to start “Makeup Artist Mondays” where I would feature a new makeup artist and talk about their talents. However, that will have to wait until next week. 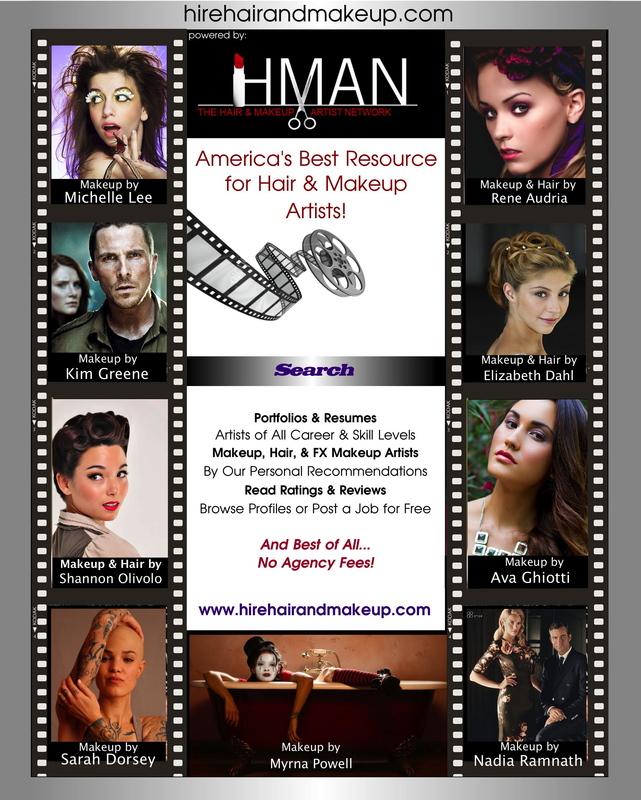 HMAN ad recently placed in the Directors Guild Magazine, letting industry folks know where to find quality hair & makeup artist. Plus the pics in the ad highlight members work. Just another benefit of the organization. Instead of blogging yesterday, I was working on the last day of shooting, for a short film with Back To One Films founders Dan Beals and Ryan Lacen. Two very cool cats to work for on a beautiful Monday. Later I attended my very first Hair & Makeup Artist Network (HMAN) meeting. There was no time to come home and write in between stops. I should have brought my tablet with me so I could write on the go. I was excited when makeup artist, Cara Liedlich, told me about HMAN. Being a freelance makeup artist can be a bit lonely and daunting at times. Career coach Shawn Tolleson described it as “The crooked ladder” because there is no on certain way to get ahead. If you want to be a doctor, there is a clear path as to what you need to do to reach your goal. You know you have to go to school, you know exactly what you need to study and that you will do a residency and then, bam! You are a doctor. Our field of study isn’t as cut and dry. Even the best education won’t guarantee you work when you graduate. What is The Hair & Makeup Artist Network? The Hair & Makeup Artist Network is the first networking organization for Hair and Makeup Artists by Hair & Makeup Artists. HMAN offers a myriad of helpful services and opportunities for learning and networking. Last night they had a braiding hair styling demo from a Matrix salon professional, and a presentation from Strategy Coaching founder Shawn Tolleson. HMAN helps freelance artist navigate the murky waters to success. I just joined and received my welcome email this morning. Here are a list of benefit members (like me) will enjoy. Well worth the $13.25 a month to join.